I have been walking on this path for so long. Life and time are moving forward. I just realize that making effective arts requires honesty and sincerity as a foundation. The value of a human is measured by the result of the one’s work and it will definitely have the greater value. 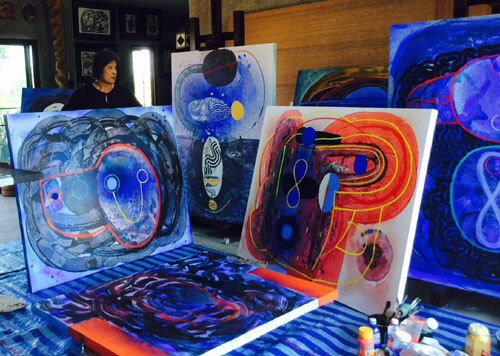 From all of my research, I have concluded that Kamol is one of the most respected and visionary artists in Thailand. He welcomed and supervised art teachers and young artists who were selected for field trips to the USA. Many artists who met him there were also impressed with his generosity. 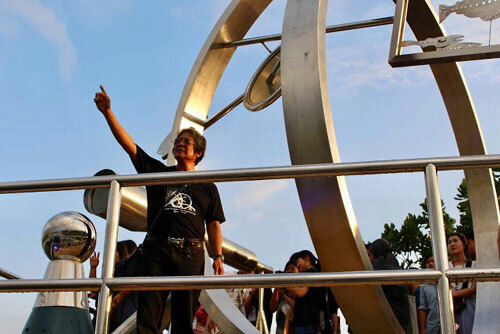 In 2018, Kamol came back with the project “Two visions of the wonderland” which was the symbol of Thailand Biennale Krabi. 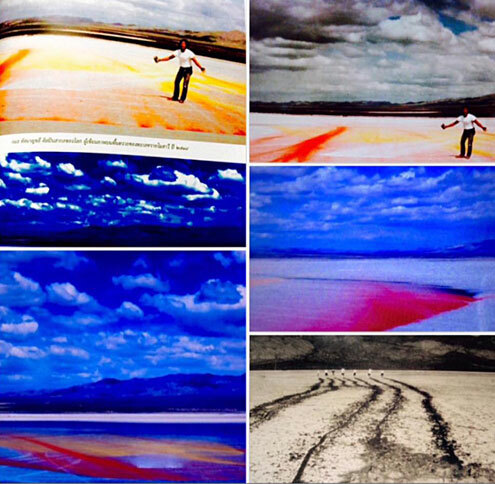 Kamol Tassananchalee has some outstanding artworks in the USA such as a color splashing in the Mojave Desert. He also supports art teachers and young artists to do art workshops in the USA. He has spent more than 16 years with the project to develop and transfer the knowledge of art to young artists throughout Thailand. Starting with the cooperation of the first minister of the ministry of culture to the present minister: Office of Contemporary Art and Culture and Thai Art Council USA. 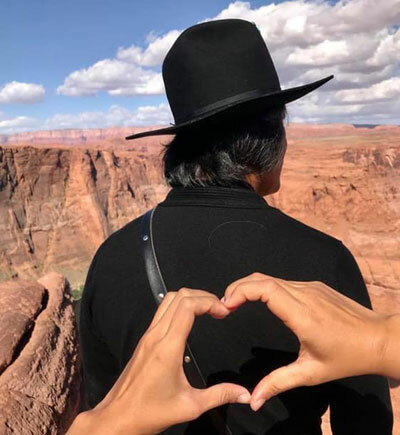 He brought artists to the Grand Canyon hundreds of times and amazed artists who went to meet him in the USA. The 9th Young Artist Talent 2018 was a field trip project to visit the Museum of Contemporary Native Arts and Canyon Road Contemporary Art which is on a road with almost 200 art galleries. They also have workshops and art lectures. JY: Please tell us about the origin of a sculpture you called “Two visions of the wonderland”. I find that it could be the suitable symbol of the Thailand Biennale Krabi 2018. My concept of this sculpture was to look at the beautiful nature of Krabi Province with open eyes. This is an important issue so I came up with the idea of using a “magnifying glass” to symbolize real and imaginary visions. Because imagination is important, I installed LED screens to show some videos of fish in the sea and important tourist attractions in the nearby islands. Another vision is to use a three-meter-long large telescope to look at Khao Kanabnam which is the natural habitat of white head eagles. They still live well in nature. There are many viewpoints and imaginations that reflect nature in every angle and even in yourself. We can see the reflections of ourselves by looking at the curved mirrors in several locations and this is imagination in another viewpoint. This piece of artwork is complete with images, light, colors, sounds from LED screens, video clips embedded in the base of the sculpture. This could be called a viewpoint of beyond reality from looking at KrabiProvince over the horizon. This is my intention from the topic I set earlier. My work was the first piece of art to be completed in the project. For my wish, I would like this piece of art, my creation, to stay permanently in Krabi forever. I realized that KrabiProvince has a long rainy season for eight months, full of storms and heavy rain. My decision was to use durable materials for this sculpture so there is no need to repair it at later time. JY: What about your education in Thailand and abroad? KT: I graduated from Pohchang Academy of Art in 1964. After that I went to SrinakharinwirotUniversity, Prasanmit Campus. 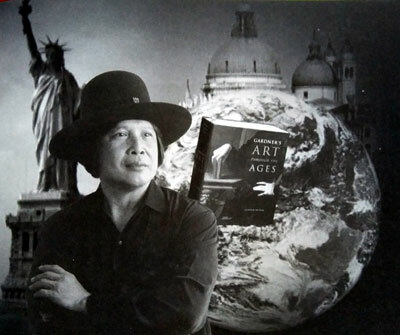 In 1969, I switched from the university in Thailand and received a scholarship fromOtis Art Institute of Los Angeles, California,U.S.A and finished my master’s degree in 1977 in the USA. After that, I became an art lecturer at LamarUniversity, Beaumont,Texas, USA in 1977 and University of California, Berkeley,CA during 1979 – 1981. JY: As you have been living abroad most of your life, is it possible for the Western art style to have a complete influence with your way of art making? KT: I think that is unlikely to happen. Although I spent more than 45 years of my life living abroad, most of my works are heavily inspired by Thai culture and Buddhism such as shadow puppets which is a form of cultural entertainment. The four elements of earth, wind, water and fire are the story of various Thai kites used in the competition. JY: What more would you like to tell us about your life. KT: When I was around 27- 28 years old, the news agency USIA came to me to shoot a video interview and the Freedom Magazine contacted me to publish an interview about my life. 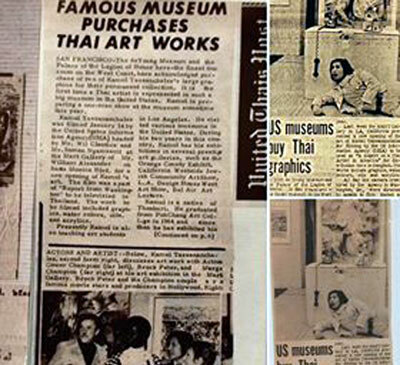 46 years ago, I brought a Thai national flag to the US due to my achievement as an artist. That was one of the best moments in my life. De Young Museum in San Francisco, California and the Palace of Legion, San Francisco bought contemporary artworks for the first time in their history. At that time, I was a lecturer at Berkeley. JY: Please tell us about the project to support art teachers and young artists that you are a part of? KT: “Ton Mai Roi Om” is an important ongoing project in which we artists nurture new seedlings of artists to prosper and be successfu. We now have many supportive organizations such as the Department of Cultural Promotion, Office of Contemporary Art and Culture. Many national artists in visual arts are the spearheads from the outset starting such as Thawan Duchanee, Prayat Pongdam, etc. The first year of the project began at Rajabhat University ChiangRai Province in the North of Thailand. This project sparks much interest from elementary, secondary, high school and university students from nearby provinces throughoutThailand. The whole project lasted two days. The number of participants exceeded 2,000 people per day so we had to change the location from four large tents to the large convention hall. The occurring problem was that the equipment was insufficient but most students prepared their equipment themselves so the activity went smoothly. 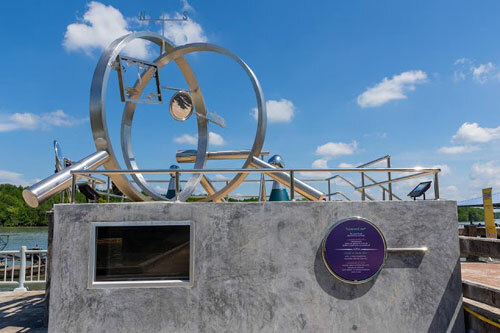 Due to its popularity, the project was organized four times every year and rotated to different regions in the North, South, Northeast, East and Central regions. Apart from visual arts, artistic writing and performances were added to the project and these formed the three main branches of art. This is the good way for the national artists in the three branches to transfer their knowledge and experiences to the younger generation of artists. There were around 10 – 11 stages of knowledge for the students to participate in. The national artists in the central regions were the largest among all the groups. Sometimes there were 15 – 22 national artists in various branches such as Fine Art, Graphic Arts, Mixed Media, Photography, Architecture, Sculpture, Poetry and Short Stories. Performance depended on each region: Traditional Art, Traditional musical instruments such as Sabudchai drum, Thai flute as well as Thai traditional and Country Singing. After we took care of the new seedlings of artists, it was about time for us to find the uncut diamonds in the mud. Once we found these diamonds, we faceted them into beautiful gems. Simply put, we support these talented young artists to be confident and skillful in their own ways. 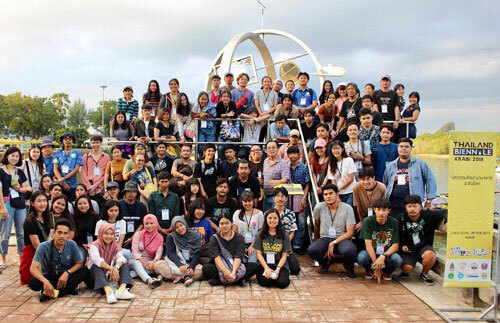 For this project, hundreds of university students throughout the country applied to this camp. At first 70 people from all regions were selected and they had to pass some challenges. In the end, only 10 – 11 students were chosen to travel to the USA to exhibit their works, have a field trip, do some workshops and stay with me for two weeks. 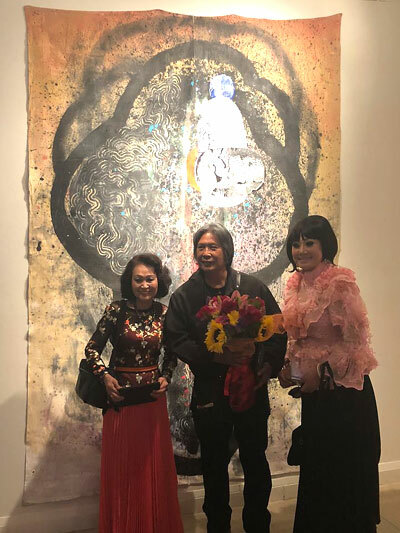 During this time, I brought them to many famous art galleries and to meet some professional artists as well as visit art departments at several universities.